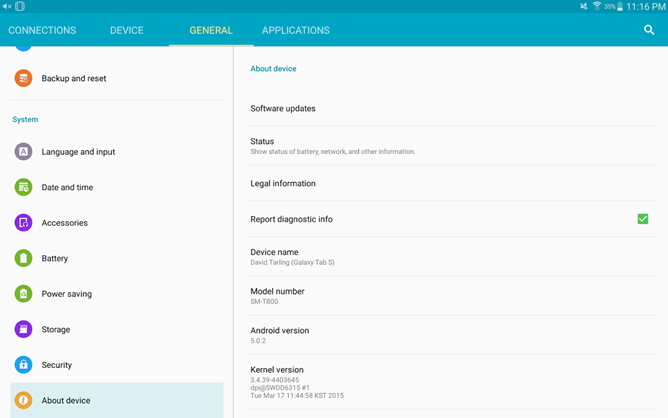 Samsung Galaxy Tab S 10.5 model number SM-T800 has received the official android 5.0.2 Lollipop OTA update. The update was first released in France, US and Canada and users have already reported the update as totally bug free and smooth. If you haven’t received the update yet then don’t worry because I will teach you how you can upgrade your Galaxy Tab S 10.5 Wi-Fi SM-T800 to latest android 5.0.2 Lollipop firmware. This tutorial is meant to be applied only on the international version of Samsung Galaxy Tab S 10.5 model number SM-T800. If you do not know the model number then go to ‘Settings>About device>Model number’. Check here it should be T800 otherwise this tutorial is not for you. Backing up the data is an good idea because if something goes wrong you will loose your precious photos, videos and other files. So copy all the data stored on your phone to PC. Use androzip to backup android apps apk. If your tablet is rooted then after upgrade your root access will be revoked, so you have to root it again if you want to. Battery should be charged upto 80% level. Enable ‘USB Debugging’ from ‘Developer options’. If ‘Developer options’ is not visible then go to ‘Settings>About device’. Here tap the ‘Build number’ 10 times to unlock the ‘Developer options’. Do not try this tutorial except Galaxy Tablet S 10.5 T800 or your tablet will get bricked then do not blame us for your doings. By following the tutorial you agree that if something wrong happens to your Galaxy Tab S 10.5 then you will be responsible for it not us. However this tutorial is written for the Cellular South version of Tab S 10.5 in united states but it will work on all regions. Galaxy Tab S 10.5 Android 5.0.2 Lollipop Factory Image US Download. Download the firmware according to your region and extract it on desktop. It contains a file with .md5 extension. Switch off your tablet and reboot it in download mode by pressing 'Home', 'Volume down' and 'Power key' at the same time until your tab vibrates. Press the volume up button to enter into odin mode. Now connect IT to PC via USB cable. Let odin recognize your DEVICE. When it is recognized by odin the field under <ID:COM> in odin will turn blue and you will see a message "<ID:0/016> Added!! ".This means that your Galaxy Tab S 10.5 is recognized and is ready to be flashed. When the process is completed odin will return a message 'PASS'. When your tablet first boots to home screen then disconnect it from PC. Note: If your Galaxy Tab S 10.5 doesn't boot to home screen then force restart the tab in recovery mode by pressing home, power and volume up key simultaneously. Press the volume up key to continue. Here choose 'Wipe data/Factory reset'. Use volume keys to move up and down and use home key to select. Wiping will delete entire data stored on the phone so make sure that you have took a backup of your data in above steps. You have successfully updated your Samsung Galaxy Tablet S 10.5 Wi-Fi to android 5.0.2 Lollipop firmware.